Tackling Big Projects With a PLAN! Last week, we discussed how to beat procrastination. One of our biggest tips is setting small goals, and today we’re looking more closely at that idea: specifically, how to tackle big projects by breaking them up into small, actionable steps. After all, there’s nothing more intimidating than knowing what your finished product needs to look like, yet having no idea where to begin. You may have heard the quote, “Fail to plan, plan to fail.” We’re here to help you plan so you never fail! Sometimes, the easiest way to start a big project is simply by getting your thoughts organized. That’s where our printable project planner comes in! Instead of rifling through notebooks, handouts, and syllabi, jot down everything you need to know (and everything you need to do) in one place. Map out what needs to get done, what you need in order to do it all, and anything else pertinent to the assignment. When you get a big assignment, it’s crucial to figure out a realistic timeline for completing it. We all know what it’s like to pull an all-nighter to finish a project or study for an exam that we’ve known about for weeks ­– it’s not fun. Plus, you’re probably not going to ace something you’ve thrown together or crammed for last minute. By breaking up a big project into realistic, manageable pieces right off the bat, you’ll have actionable steps to do each day. Doesn’t that sound better than doing a million things the night before? 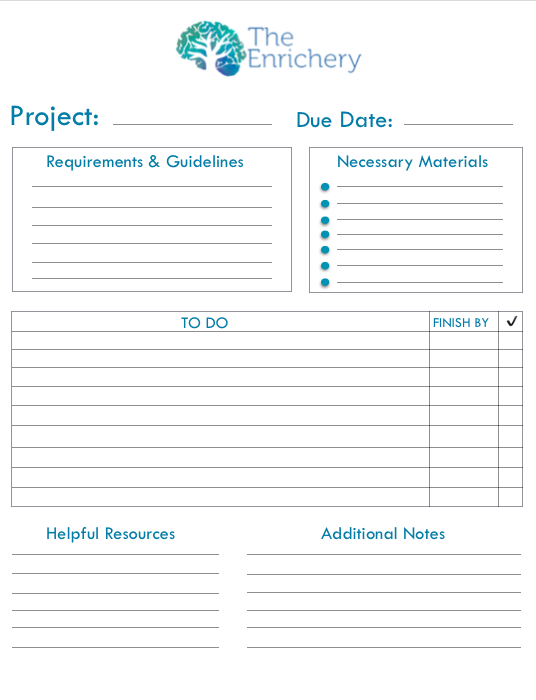 Print out our custom project planner, and see what happens when you plan ahead, and break up big projects into manageable steps. After you see how much this technique helps, it’ll become second nature!